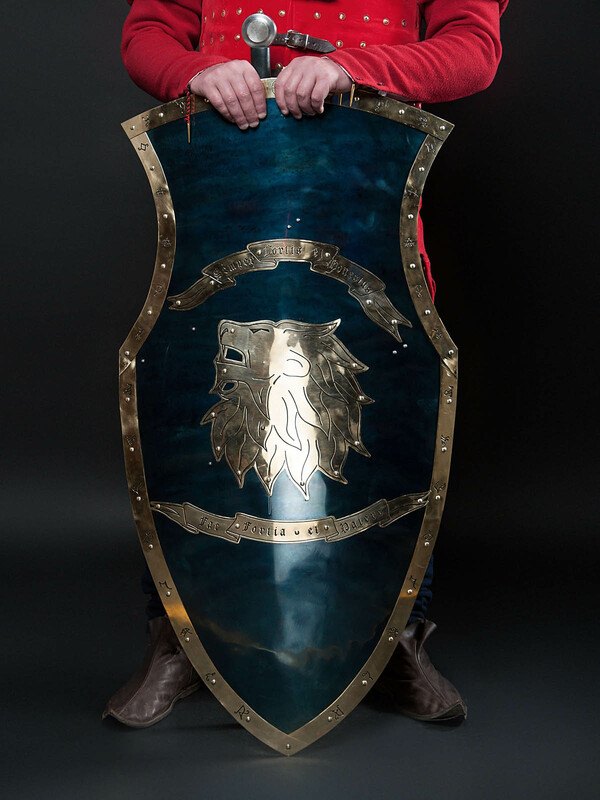 Take it to any SCA or LARP events, make a parade of it at Stage performances, this fully hand-crafted shield is good enough for any of them. 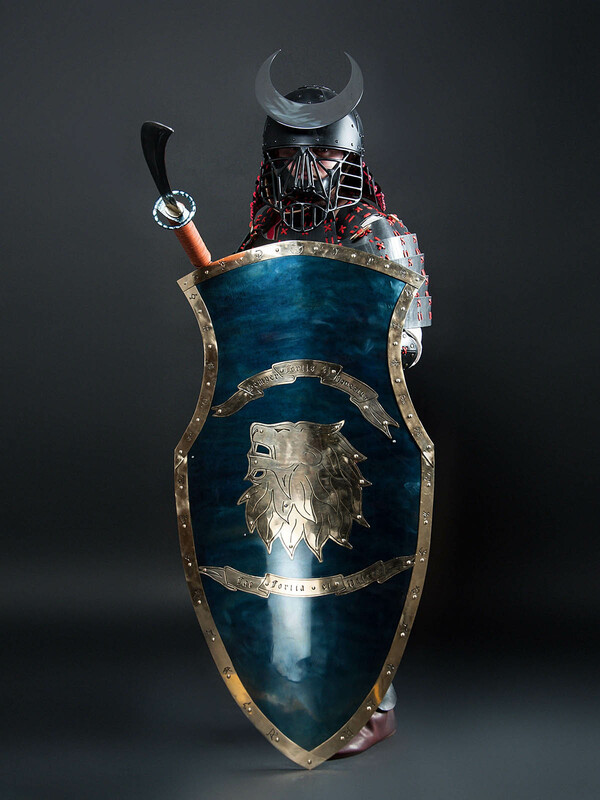 This shield was made to unique customer design with individual additions. Such as runes and wolf/lion`s head. It is an example of craftsmanship work. You can order your personal etching pattern and main symbol. As an additional option, you can order your own type of coat of arms, edging, etching or any other decorations. We will be happy to help you creating of unique warrior shield model. Please contact us [email protected] to order the shield you prefer.  - Rework your order at our own expense or do a full refund in case if you don’t like an item. Check out these models of real warrior shields: Aquiline Creased Shield and Kite shield with painting. 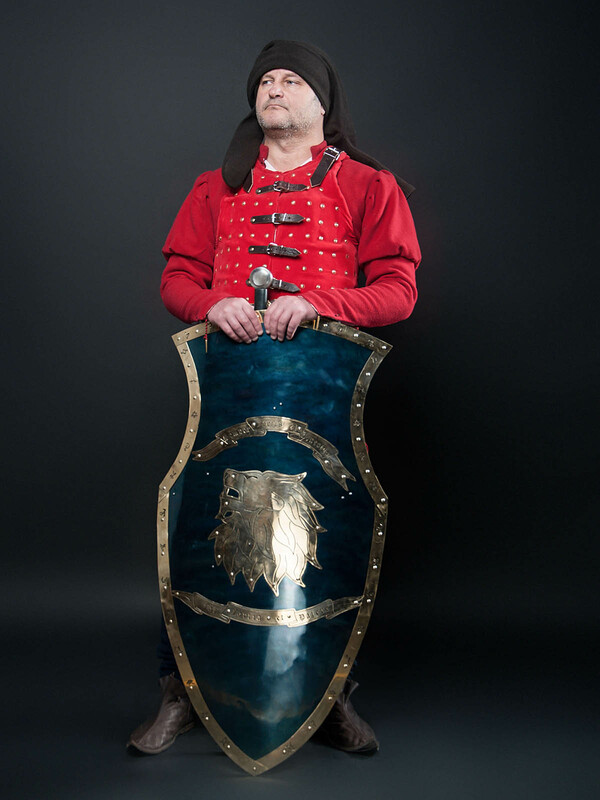 We offer to complete your cool noble warrior look with Full-plate Gothic armor XV century, Knight’s Medieval belt and Brass crown with etched elements. 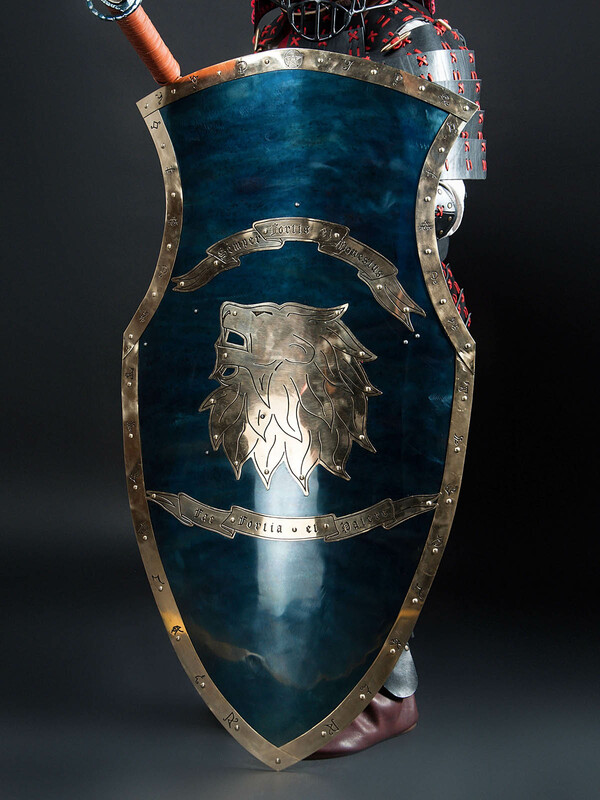 In section shields, you can see all shield models that we offer for ordering. If you did not find any for your taste and wish, please send us photo and description of the required model and we will make it for you. Plates armour or guest from the East It is good one, isn’t it? This Northern Wolf will stand out against other troop and its status is Jarl at the very least. Why? Well, besides classy look, which will blow away all Scandinavian ladies at festival, it has a lamellar armor. Such early medieval armor is rare and individual piece for a Scandinavian warrior and we will tell you why. First of all, you have to know that historians cannot provide with enough reliable information about usage of lamellar armor by north warriors. In fact, there are only plates, which had been found in archaeological sites of Birka and mass grave on Gotland Island. Also, any historian will tell you that there were no entire lamellar armor in Birka. Seven hundred and twenty intact and fragmented plates (similar to the plates from burial mound 11 in Balyk-Soot, Altai) had been excavated in the period from the 1877 until 2000 years. Thereafter, there is no consistent and the only true assemble configuration for such lamellar armor. Part of..
Badge is based on the archaeological finding from Victoria & Albert Museum. Strawberry badge was worn in order to show affiliation with noble family. .. Ordinary gambeson (gambison, gambaison) - popular type of medieval padded underarmor. This model was widespread in the XI-XV centuries. As common soldiers, so noble warriors were wearing such quilted jerkins. Ordinary gambeson is suitable for usage for both, men and women. We make padded gambesons by historical patterns and basing on the ancient pictures of this padded underarmor. Made-to-measure gambeson may be sewn by two ways: Machine manufacturing. Tailors will make padded armor by your parameters, using sewing machine. Hand sewing. Custom gambeson will be completely sewn by hands of our tailors. Such type of manufacture is historical one and is offered for additional costs. You can use this gambeson armor for: SCA HEMA Larp Stage performances Medieval festivals Reenactment events Base price includes following options: 1-2 layers of padding (natural sheet wadding 50% cotton, 50% wool); Natural (uncoloured) cotton for outer and inner shell; Standard sleeves’ attaching (closed..
Women's viking clothing "Sif style" is historicaly correct. Clothes are made-to-measure. Viking outfit consist of: undershirt; dress; dress; cloak. The base price does not include fibulas. You can add them to your medieval viking clothing as option. They will help you to make your look complete. Undershirt (medieval chemise) is made of linen and decorated with hand-made embroidery around neckline and cuffs. Dress is made of wool (not less then 80% natural wool). It is decorated with inserts of silk on the neckline and cuffs. Cloak is made of wool (not less then 80% natural wool). It cdecorated with hand-made ebroidery oth edges of cloak. Fibulas are made of brass. The colors and types of fabric could be another by your choice. After you will place order for this outfit please write us on [email protected] what colors do you prefer for all items. ..